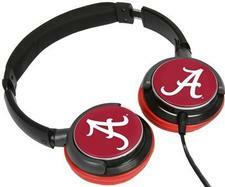 NCAA Sonic Boom 2 Headphones - $29.99 - GolfersEdgeOnline.com - Best Golf Equipment On The Web! Enjoy rich sound with the Sonic Boom 2 Headphones from AudioSpice! Each set of headphones features the team logo printed in full color on comfortable swivel earcups. Listen to your favorite music and raise your team pride high! If you have any more questions about the NCAA Sonic Boom 2 Headphones; do not see the model you are looking for; need custom options; or prefer to not purchase online, then please call us at (630) 656-1291.